Many centuries ago in Burma, the temple of Lao-Tsun was built for the goddess Tsun-Kyan-Kse. One hundred white cats lived in, and guarded the temple. One day, while the head priest, Mun-ha, and his companion cat, Sinh, were praying to the golden statue of the goddess, the temple was raided. Mun-ha was killed as he tried to defend the goddess' statue, whereupon Sinh leapt upon his master's prone body, and hissed his defiance at the bandits. With this a miraculous transformation took place, as the cat's white body took on the golden hue of the goddess. His face, tail, and legs became the colour of the earth except where his paws touched his master's body. Here his paws remained the white of purity. The junior priests were emboldened and the bandits dismayed by this miracle, and soon the priests drove out the bandits. For the next seven days Sinh refused all food and water, finally dying and taking his master's soul to paradise. When the priests came to choose Mun-ha's successor, the temple's hundred cats came into the holy chamber, but they were no longer white. They had all undergone the same miraculous transformation as Sinh. They encircled a young priest, Lioa, thereby choosing him as the new head priest. It is widely beleived that the first Birman cats to appear out of this Temple were a breeding pair, who in the early 1900's were given as a gift to a Frenchman who helped the Temple Monks. The Breed was first officially recognized in France in 1925. Numbers dwindled during the second world war but since then have been spreading first around Europe, and then around the rest of the world. 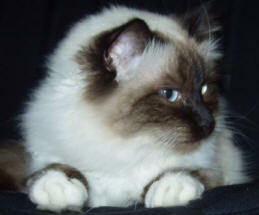 The Birman is a semi-long haired colour point cat with pure white feet. They have china-blue to sapphire-blue eyes. They have round faces with roman noses. Their coats are long and silky but do not mat. The original colours for a Birman were Seal point and Blue point, but with careful breeding there are now many more colours to choose from. Other colours are Chocolate point, Lilac point, Red point and Cream point. All colours can also have tabby or tortie patterns. Birmans have a wonderful balanced temperament. They are very intelligent and bond to their people very strongly. Birmans also are very curious, they like to find out what you are doing or about anything that is new. Birmans are a people-cat - they love to be around their people. They love to be loved. If left alone, they will hunt around until they find you. If not given enough love they will get your attention with a gentle love bite, just to tell you they are in need of you. Birmans are not extreme in their temperament in any direction, they are not as active or demanding as a Siamese, and are not as aloof or antisocial as a Persian. They adapt happily to being confined to a unit or appartment, and are very patient with children. They love a backyard with a tree to climb, but are also happy inside the house, with a good cat scratching post and your bed to sleep on. Most breeders recommend a high-quality dry food. Birmans can be free fed without becoming overweight. Keep a good supply of clean, fresh water available at all times. Birmans are very easy to groom. Their single layer coats typically need to be combed once in a while. During summer furballs can be a problem. Giving a dose of Catalax for two consecutive days in a week and then none for the rest of the week will help alleviate this. Most Birmans never have to deal with matting of the fur because it just doesn't! Birmans require very little training. They typically teach themselves about the litter box as very young kittens and never forget. Birmans are ideal for apartments and smaller houses. They are not as destructive as other breeds and do not climb curtains and can be quickly taught not to get on benches or tables. They do not hunt actively, and are quite happy to spend most of their time inside. Birmans usually insist on spending the night on their people's bed.